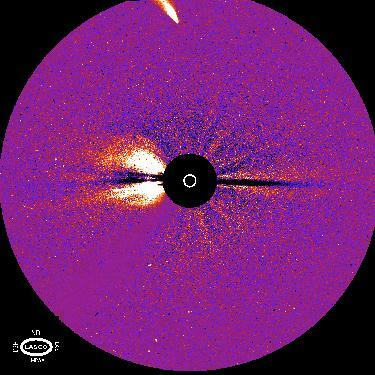 On May 1, 1996 there was a coronal mass ejection (CME) seen by the LASCO C3 coronagraph while the Comet Hyakutake was also in the field of view. This provided a spectacular picture of a comet and an explosive solar event in which matter streams out from the sun at hundreds of kilometers per second in a single image. This image was created by subtracting an image prior to the CME from one during the CME. This has the effect of emphasizing the changes in the corona.